When we started gathering recipes for Sunny Days in Texas, my first thought was Texas toast. It’s an important part of Texas cuisine, and not something you can find easily outside Texas. But that was the problem. I’m not sure you can make Texas toast outside of Texas and the surrounding states. Texas toast is made with inch-thick slices of white bread (the uber-processed kind). The bread is buttered on one side and then broiled or griddled on both sides. It doesn’t have cheese (that’s cheesy bread). It doesn’t have garlic or herbs (that’s garlic bread). Just thick buttery bread, crispy on the outside and soft on the inside. Perfect for mopping up extra barbecue sauce or country gravy. The problem is I don’t think you can find the right kind of bread in most of the country. And I really don’t think you can find the right kind of vegan bread. And there isn’t a good substitute. So here’s the recipe that wasn’t included in the zine. I make it with Butterkrust bread, which, ironically, is vegan. Even the l. cysteine and glycerides. I said there’s no substitute, but if you can’t find store bought Texas toast bread, find a loaf of unsliced sandwich bread and cut it thick. It’s not quite right, but it’s close enough. Turn on the broiler and broil each slice of bread on one side until golden, maybe two to three minutes. Next, butter the other side of the bread thickly. Keep buttering until you’re embarrassed by how much butter you’ve used. Make sure the butter gets all the way to the edges of the bread, this isn’t the time for sloppiness. Sprinkle with salt. Broil the buttered side until golden. Watch closely so the bread doesn’t burn. Seriously, keep the oven door open and your eyes on the bread. Don’t answer the phone. Don’t pet the kitties. Just watch. 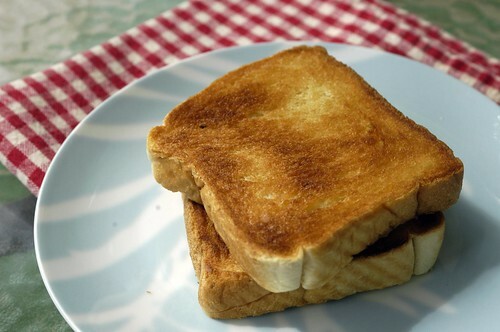 Eat Texas toast with barbecue or chicken-fried foods or use it to make fancy greasy sandwiches. This entry was posted in recipes by mollyjade. Bookmark the permalink. Psh. That Pepperidge Farm stuff is garlic bread pretending to be Texas Toast. I’m even doubting your Springfield dish now. That looks like some great toast.